Adamm’s Deli is pleased to offer catering services for your luncheon meeting, business conference or social event. 24 hours notice is required. Call 410-850-4333. In addition to Specialty Sandwiches, Classic Wraps and Super Salads available from the menu, Adamm will work with you to customize a food presentation, including a limited number of hot entrees, that will meet the expectations of your event. If you think it, Adamm will endeavor to make it. His promise for all occasions will be delicious food, bountiful portions, good customer service and timely delivery. The standard charge for delivery and set-up is $20.00. Bill’s father and mother, now deceased, lived on the Chesapeake Bay close to Annapolis. Bill’s father was a recreational fisherman and caught crabs from his boat using a trotline and dip net. Bill’s mother steamed the crabs using vinegar, beer and Old Bay Seasoning. For many years, the crabs were savored at family picnics on Labor Day. Adamm tasted and enjoyed his first Blue Crab at the age of 4. From this heritage of home cooked seafood and good living on the Bay was born the family recipe for Wild Bill’s Crab Cake. Its key ingredient is fresh (never pasteurized), jumbo lump meat from the Blue Crab. The delicate cakes are held together by a special concoction of sauces and spices, with minimal filler. 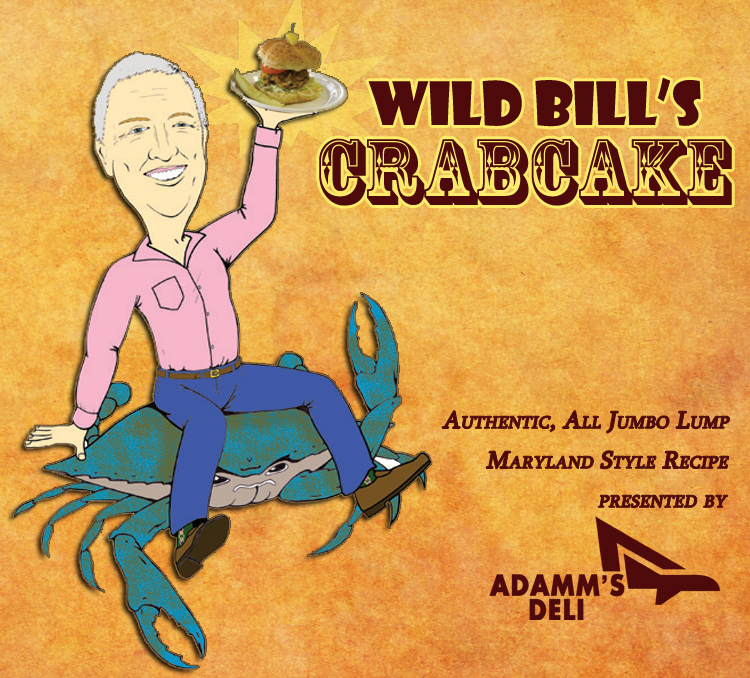 Wild Bill’s Crab Cake, said by many to be Maryland’s best crab cake, is served daily at market prices. Wild Bill’s Crab Cakes can also be ordered raw, with baking instructions, for cooking at home. Advance notice is required. Call 410-850-4333.